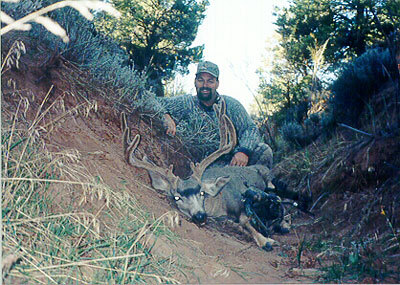 I had the opportunity to hunt some private land in Utah and here is the result for the 2000 Season. I shot the deer at 32 yards with a PSE Thunderbolt Maxis Cam bow and AFC 2400 arrows tipped with 85-grain Thunderheads. The buck has a 22-inch spread with 5-inch bases and scored 124 even with the reversed 3-point from the main beam on one side and the G-2 of the other.